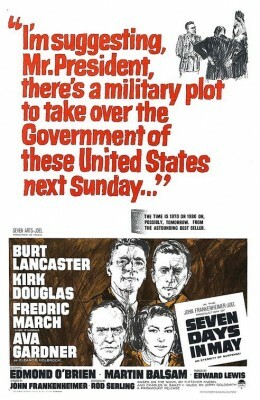 Again timely as hell, John Frankenheimer's Seven Days in May (1964) is a political thriller less ingenious than his earlier The Manchurian Candidate (1962) but still very credible, suspenseful, and intelligent. Adapted by Rod Serling from the novel by journalists Fletcher Knebel and Charles W. Bailey II, its story concerns the gradual realization by government officials that a military coup against the American President is but days away. Though originally released by Paramount, Seven Days in May was a co-production among the indie companies of Frankenheimer, star Kirk Douglas, and Seven Arts. When the latter took control of Warner Bros. in 1967, most of its catalog moved there, hence this Blu-ray under the Warner Archive label. The setting is the near future, the early 1970s (clues to this include 1970 license plate tags, the use of teleconferencing, etc.). Four-star Air Force General James Mattoon Scott (Burt Lancaster) vehemently opposes an unpopular nuclear disarmament treaty with the Soviet Union, recently signed by liberal U.S. President Jordan Lyman (Frederic March). Allied with the other conservative Joint Chiefs of Staff excepting Vice Admiral Barnswell (John Houseman) and right wing members of Congress, Scott plots a coup d'état to forcibly remove President Lyman from office during a military exercise and to take control over the country's entire communications system. The first and best half of Seven Days in May follows the growing suspicions of Col. "Jiggs" Casey (Kirk Douglas), Director of the Joint Staff under Scott at the Pentagon. He has a chance encounter with an old friend, Col. "Mutt" Henderson (Andrew Duggan), whose been assigned to a vast Army combat unit called ECOMCON. Located outside El Paso, neither Jiggs nor the congressional budget office has ever heard of the mysterious base. Other subtle clues abound. A minor functionary at the Pentagon (Jack Mullaney) tells Jiggs about a betting pool among the Joint Chiefs for the upcoming Preakness Stakes, which Jiggs suspects may be a code used among them. Late at night, Jiggs also catches sight of fascist Senator Prentice (Whit Bissell) entering Gen. Scott's quarters, but the next morning Scott claims he was in bed asleep by 8:00pm. Though agonizingly conflicted and uncertain, Jiggs decides to share his suspicions with President Lyman in a late-night meeting. Lyman takes the threat seriously, and orders trusted aide Paul Girard (Martin Balsam) to question Barnswell; alcoholic Senator Clark (Edmond O'Brien) to confirm the base's existence; and for Jiggs to dig up dirt on Scott from Eleanor Holbrook (Ava Gardner), Scott's former mistress. Given similar reaction to recent events like the 2015 Iran nuclear deal, Seven Days in May has in some ways come full circle. At the time of its release hysterical anticommunist extremism was dying down, with Scott was partly based on Gen. Edwin Walker, whose radical right wing views and public politicking while in uniform forced his resignation in 1961; and Gen. Curtis LeMay, a proponent of a first strike nuclear strategy, and who later ran as George Wallace's running mate in the far-right American Independent Party in 1968. Then and now but less so in the decades in-between, probably many seeing Seven Days in May would regard Gen. Scott as the hero and President Lyman as the villain, rather than the other way around. The heart of the movie, of course, is the quandary Kirk Douglas's Jiggs find himself embroiled. He gives an unusually subtle performance as a low-key career soldier used to following orders, who despite his high rank never considered abstract problems such as a having to abide by an international treaty he considers foolhardy. Douglas is fascinating to watch in these scenes, as he works through such matters in his mind via questions posed by his President. Likewise, Burt Lancaster is equally fine as the military man with the opposite view: that the treaty puts the country in imminent peril and his ability to possibly change things trumps the rule of law and the safeguards set forth in the Constitution. The certainty of his beliefs - evangelical, like many hold today - is what makes Lancaster so effective and indeed, disturbing. Near the end Lyman and Scott meet in the Oval Office, a scene Frankenheimer later considered one of the best of his career, and Scott's gradually seeping self-righteousness in this conversation with the calm but determined President is incredibly well done. Seven Days in May is excellent when the focus is on Douglas's character, less so when it diverts to the subplots about Scott's mistress and the secret army base. The stakes are too high to care very much whether Jigg's emotional manipulations will hurt Eleanor's feelings. It's all pretty much a set-up for Lyman to obtain a smoking gun (love letters from the married Scott) to use against the general, and whether or not Lyman will betray his own personal code to stop him. I haven't read the novel but one guesses the part was beefed up to accommodate a star as big as Gardner. Surprisingly, while the ensemble cast is nearly uniformly excellent, critics of the time most enjoyed the film's weakest link, Edmond O'Brien, who surprisingly was nominated for a Supporting Role Academy Award and who won a Golden Globe. Like Charles Laughton in Preminger's Advise and Consent (1962), O'Brien plays a broad caricature, the heavy-drinking senator from the Deep South with the thick regional drawl. It's a hammy, overly theatrical performance. The film has been described as science fiction, which is literally true, but one suspects that was more a symptom of excusing away the film's very believable premise, believable enough for John F. Kennedy, when he read the novel, but one that many did not want to face. These days, facing our own Constitutional crises and with dozens of even darker political thriller made since then, people are surprised when it's categorized as such, maybe with good reason. Presented in 1.85:1 widescreen, the black-and-white Seven Days in May looks great throughout, with Frankenheimer's flashy but effective direction shown off to good advantage. The mono audio, supported by optional English subtitles is fine. Supplements consist of a repurposed audio commentary track by the director and a trailer. 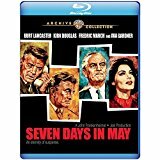 Not in the same league as The Manchurian Candidate but still way above average, Seven Days in May is Highly Recommended.